They came in a packet. They were soft and sweet and pretty damn good. Instead I recreated them at home. It's amazing how our senses can be so nostalgic. The sound of a hockey game on TV puts me right back on the couch of my living room in the house I grew up in with a big bowl of ice cream and my dad falling asleep on the rocking chair. The smell of a freshly sliced cucumber brings images of Nonno calmly preparing salad for dinner at the kitchen counter. The taste of orange and almond reminds me of mom's famous Christmas biscotti. A fruit turnover is technically something like a mini hand-pie. It is typically pastry with a fruit filling, more like these Mini Strawberry Pop Tarts. Those Voortman cookies were not that, but they were delicious nonetheless. Plus they remind me of being a kid and were apparently the husband's favourite. The key to matching these cookies is making a soft batch dough, that is.. a dough that bakes up soft and not crisp. Oh.. and a secret ingredient that they didn't care to mention on the front of the pack - coconut! I could always taste that there was coconut. This recipe has almost half the sugar of a typical cookie recipe. 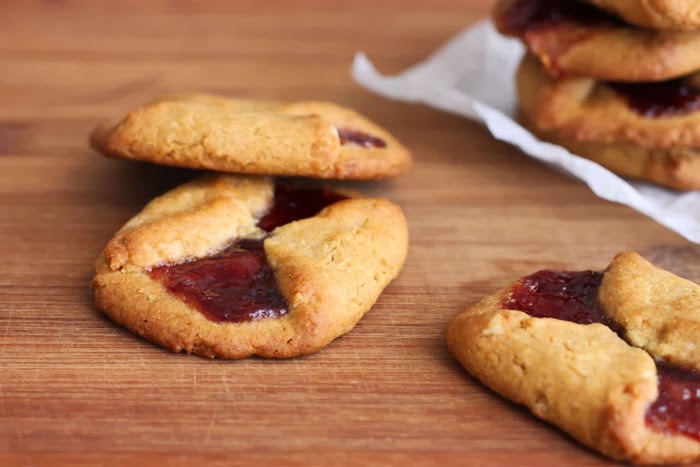 This is keeping in mind that these cookies will be dotted with jam, and also for the purpose of softness (not crispness). Honey is a form of liquid sugar that binds moisture very strongly and helps keep these cookies moist and soft. 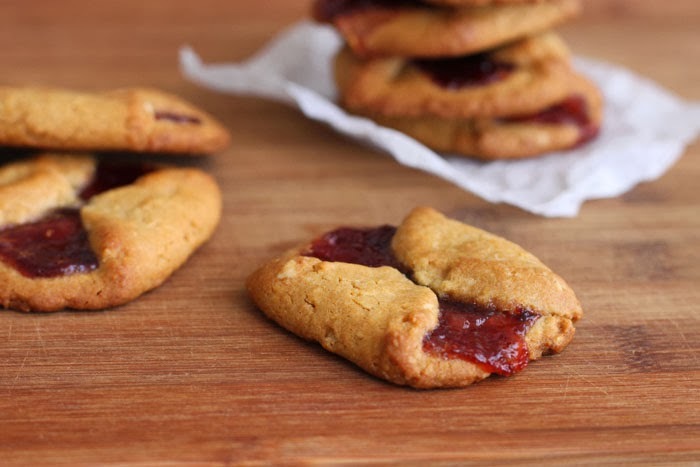 It also lends a signature flavour that makes turnover cookies so memorable. Yolk is the best part of the egg - rich in vitamins and minerals, full of good fat and functional protein. It will add flavour, tenderness and some binding properties, without all the added water and strength that an egg white would contribute. The method of making this recipe is more similar to pastry than cookies. There's no creaming of butter and sugar. Instead, you blend all the dry ingredients first, including flour and sugar, and then rub in the butter until it forms crumbs. Sounds like pie crust, right? Then add the honey, yolk and vanilla and stir until a soft dough comes together. Coating the flour in fat like this is another step towards creating a soft and tender (not crispy!) dough. To create the "turnover" shape, I take a ball of dough, place it down on my baking sheet and push into it with the palm of my hand to flatten it out. That does the trick - no need to dig up the rolling pin and rummage through the cookie cutter drawer - Lord knows I can never find anything in there anyways! Now we put a small spoon of jam in the center of each round and gently bring in the sides to fold over the jam so that they overlap slightly. 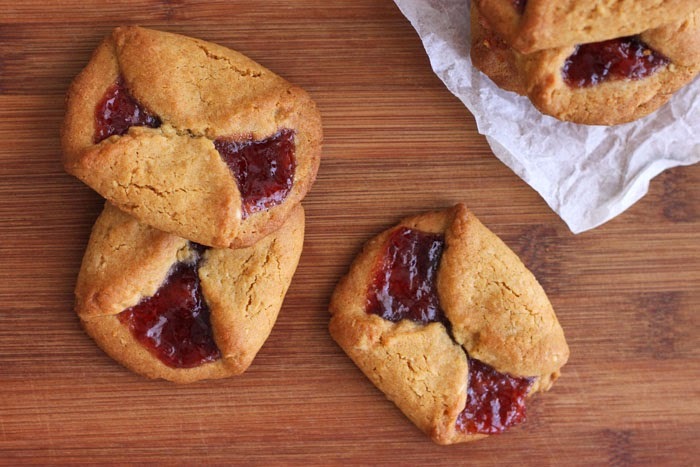 As they bake, the cookies spread and the overlapped sides move outwards to expose the bubbly jam. That's it friends - Strawberry Turnover Cookies in the making. Preheat oven to 180°C/350°F. Line two large baking trays with parchment paper. Combine flour, brown sugar, baking soda, salt and coconut in a large mixing bowl. Cut the butter into small pieces and add to the flour mixture. Rub in the butter with your fingertips until the mixture resembles coarse breadcrumbs and all of the flour is coated with fat. Add the honey, vanilla and egg yolk and use a wooden spoon to mix it together. Begin mixing with your hands until a smooth, soft dough forms. The dough will be moist. Cover with plastic wrap and refrigerate 30 minutes. Shape the mixture into balls and arrange on the prepared baking sheet so that they are 6 per tray. Place the palm of your hand over a ball of dough and press down gently in a sort of smearing motion to flatten the dough to about 2-inch diameter. It is OK that the sides are thicker than the center. Place less than a teaspoon of jam in the center of each dough and fold up opposite ends and pinch gently where they meet over the jam. Refrigerate for 15 minutes on tray before baking until golden brown, for 10-12 minutes. Transfer tray to a wire rack to cool completely. I think these would make the perfect breakfast! i love jelly cookies. they look great! 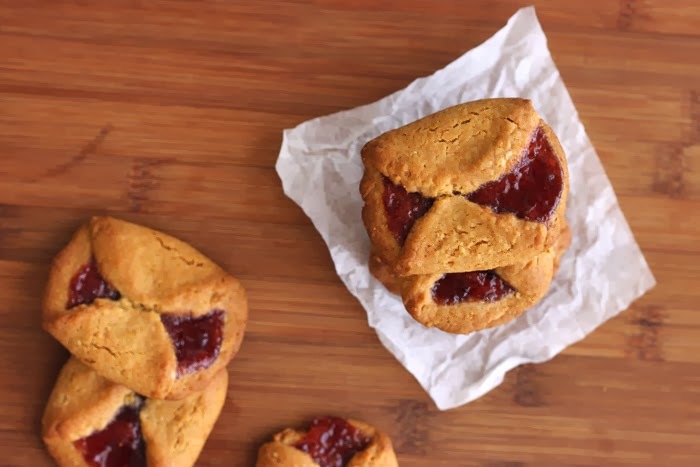 Voortman turnovers are my favourite store-bought cookies EVER, and I've been scouring the internet to find a recipe that tastes like them. This were delicious, but still not the same... not that I think I'll ever get it exactly right, but this was farther away from the flavour than I expected (but again, still DELICIOUS!). I think I'll try it again with more coconut - to see if that helps.